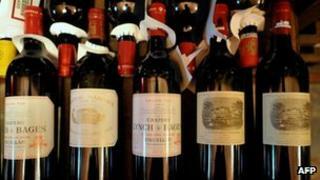 A wine dealer has been found guilty in New York of manufacturing fake vintage bottles for illegal profit. Rudy Kurniawan, 37, was convicted on two counts of wire and postal fraud in federal court on Wednesday. He was accused of fooling buyers into thinking wine made in his Arcadia, California, kitchen was rare. Arrested in 2012, the Indonesian-born vintner was accused of selling up to $1.3m (£793,257) in counterfeit bottles from 2004-12. Authorities were said to have found thousands of labels for fine Burgundy and Bordeaux wine along with full, unlabelled bottles in Kurniawan's home. Kurniawan's fraud funded a lavish lifestyle in suburban Los Angeles, prosecutors said. An avid collector himself, Kurniawan was once considered one of the best aficionados in the world. In 2006 alone, it was believed he sold up to 12,000 bottles at auction. Prosecutors allege he produced at least 1,000 fake bottles in his kitchen, which Kurniawan referred to as his "magic cellar". "It is an enormous amount," prosecutor Joseph Facciponti told the media. "This was an operation on a massive scale." Defence attorney Jerome Mooney portrayed Kurniawan as a scapegoat who, in buying thousands of bottles of vintage wine, was bound to inadvertently purchase a few fakes given their widespread availability on the market. Kurniawan is due to be sentenced on 24 April.